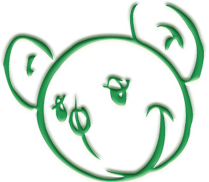 All you want to know about The Green Bear Amity Range soap and how this gentle natural soap can benefit you. Aleppo Soap – Your Skin's Best Friend! Aleppo Soap is a very popular soap for both body and face and hair. Aleppo Soap is made on a base of Olive Oil, with different amounts of the intensive treatment Laurel Oil, giving the soap their extra conditioning properties. The more Laurel Oil soap contains the gentler and more nurturing the soap. The soap is available in variants: Olive Oil Soap, Olive Oil Soap with 5% - 40% Laurel Oil. 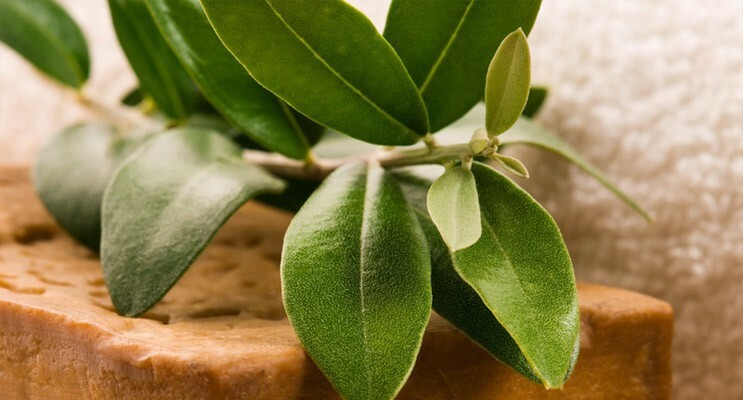 Because of its antibacterial and antifungal properties, bay leaf oil in Aleppo Soap is good against skin infections and for healing insect bites, cuts and bruises. It is also highly recommended against problems such as hair loss and dandruff. The oil has antiseptic properties is good for allergic skin and skin rashes. The higher the content of laurel oil, the more moisturising soap will be. The oil nourishes the skin, cleans and removes odours and dead skin and evens out skin tone, while being gentle on the skin. Aleppo Soap has been named after the city of Aleppo in Syria, where the soap has been manufactured according to the same tradition for over 4500 years. Traditional Amity Aleppo soap, made using a cauldron and developed with oils from a 1st press. 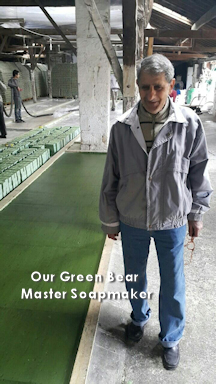 Green Bear with our brand Amity are determined to sell the original genuine soap, supporting the Syrians in their effort to re-establish themselves. "The soap is only genuine if it floats"
Answer: False. The genuine soap will not always float; this is an myth perpetuated by the internet, that has grown over the years, probably started from the term that 'Aleppo soap will float on water' or something similar. Yes some Aleppo soap will float. This will be dependent on the process and the amount of air trapped within the mix when being poured and solidifying. The exception to this; Aleppo soap which uses the higher quality method of first press of Virgin Oil processed using cold saponification method. This is the premium of soaps and they will generally partly sink or remain on the bottom as it will be a denser bar of soap – Therefore, the comment that Aleppo soap is only genuine if it floats is a fallacy and an internet myth. The manufacturing process is slow: Cold-pressed olive oil is mashed with lye in a large vats for several days. During this period, saponified olive oil develops into a thick liquid soap. During the process, the cold pressed laurel oil is added. Depending on how much laurel oil is added, the soap will have different properties and fragrance. The soap mass is then poured out onto wax paper and allowed to harden in about one day before being cut in the soap pieces and stamped with soap master’s seal and the proportion of laurel oil. The soaps are then stored for 10 months before they are ready for use. During this time the soap matures and develops even more caring and antiseptic properties. The green soap gets a golden exterior of the storage. Inside, it is still deep green of laurel oil. Aleppo soap can be used in a whole variety of ways. Hand Soap - Aleppo soap is a perfect everyday soap to wash you hands with. Body Wash - The soap is also very good to use as your regular body wash.
Baby Skin and Intimate Care - Especially the soaps with lower laurel oil content (>20%) are mild and perfect for baby sensitive skin. Face Wash/Face Mask - Aleppo soap is perfect to use as a daily face wash for any skin type, even sensitive skin. Leave on for a minute or so to get more effect and benefit from the moisturising. Shampoo - Use Aleppo soap to wash your hair! It’s much more handy than any shampoo bottle, and milder. The result is shiny, clean and full-bodied. Just rub the soap over your scalp, work up a lather, rinse and repeat if necessary. Shaving Cream - The antibacterial properties of the Laurel Oil makes Aleppo Soap the perfect shaving cream. Work up a lather with a shaving brush or in your hands. 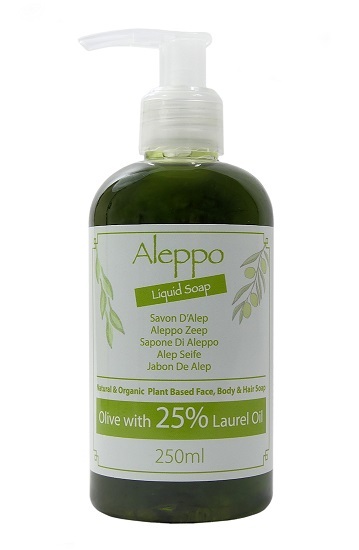 Liquid Soap - Liquid Aleppo Soap is perfect to use as a hand soap, or any other of the uses mentioned for that matter. To make liquid Aleppo Soap, grate the soap and pour hot water over it. Best stored in a pump bottle. Researchers have verified the efficacy of Laurus Nobilis (Laurel Oil) as an antifungal, antibacterial and antiviral agent, and as an effective treatment for many/most of the aforementioned maladies. The advantages linked to the usage of Aleppo Soap are endless. When used on the face and body, the soap will clean the skin deeply while it eliminates the peeled cornea layer, the sebum and sweat (which is the main cause of a tarnished complexion), dust and other micro-bodies of the environment. It can also be used as an excellent make-up remover. Using Aleppo soap will aid in preventing infection. 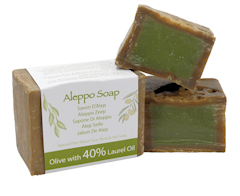 The laurel oil contained in Aleppo soap also allows it to have antiseptic and disinfectant properties that are particularly suitable for psoriasis. In this context, it is advisable to use this soap against psoriasis if it contains at least 25% of laurel oil. Our product cleans people with skin problems without ever stripping them. Indeed, we cannot talk about this soap without evoking its very high moisturising power that makes it particularly valuable! Its high olive oil content enables it to nourish the skin deeply as it is used. . Known for its nourishing and soothing properties, Aleppo soap is suitable for normal skin as well as for the most fragile skin. 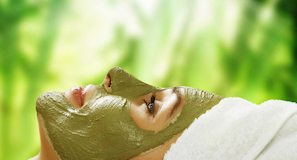 It is therefore ideal for the hygiene and care of acne skins. Reactive and often dehydrated, sensitive skin needs the gentlest care. The 100% natural composition and its restorative and soothing properties make it a perfect choice. This is not a medicine; it is a simple natural soap in olive oil that is suitable for all skin types. Recommended by dermatologists around the world. Generally, the finer the aleppo soap is, the more laurel oil it contains. 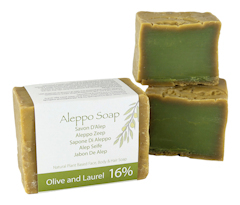 Traditional Aleppo soap can contain everything from no laurel oil up to about 40%. laurel oil is a very potent ingredient, but that also makes it very strong. Some people therefore actually prefer to buy an Aleppo soap with lower laurel oil content, as it is milder and better suited for their sensitive skin. For babies it is recommended no more than 20% Laurel content. The origin of Aleppo soap is lost in time. Although claims of its great antiquity abound, such as references in the popular press to Egyptian Queen Cleopatra and Queen Zenobia of Syria using Aleppo soap, these claims have yet to be verified by Scholarly method. It is commonly thought that the process of soap-making emanated from the Levant region (of which Aleppo is a main city) and to have moved west from there to Europe after the first crusades based on the claim that the earliest soap made in Europe was just after the crusades, but in fact the Romans in the first century AD knew about soap and Zosimos of Panopolis ca. 300 AD described soap and soapmaking. Today most Aleppo soap, especially that containing >16% of laurel oil, is exported to Europe and East Asia. Our soap is hallmarked and made by one of the main 5 families that have been doing this for over 400 years passing down there skills to the current day. Currently relocated across the border in Turkey. The war has to a degree broken up the family with some in Greece and in Italy where Abdullah and his brother run the offices. Abdullah has trained to be a Doctor and his brother a Dentist. To the current day, we are proud to be associated with the family and to supply a genuine Aleppo soap produced in the traditional way, giving our customers the confidence with a quality product. Unfortunately, due to the war in Syria many other versions are being made around the world and passing themselves off as the genuine article when they do not follow the traditional way which includes the 6-9 months of maturing the soap. One thing we can guarantee is our Amity soap is genuine and produced in the traditional way with the premium quality ingredients. The relative concentration of laurel oil (typically from 16% - 40%) determines the quality and cost of the soap. Made from natural oils derived from the fruits of olive and laurel trees and is biodegradable. The CPNP is not open to the public. Its access is restricted to the Competent Authorities (for the purposes of market surveillance, market analysis, evaluation and consumer information) and to the Poison Centres or similar bodies established by Member States (for the purposes of medical treatment) and is not available for consultation by the public.